After drywall has been installed and sealed with tape and compound, a common choice is to apply various types of texture that not only enhance the room's aesthetics, but also cover any mistakes made in the drywall installation process. 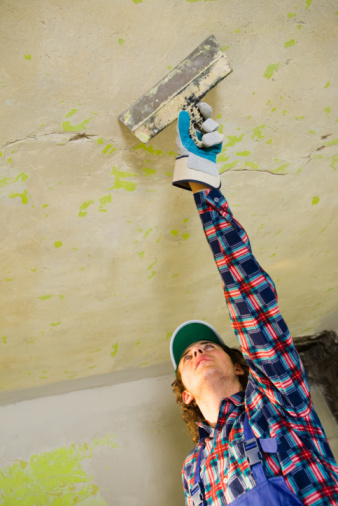 Knockdown texture sprays or rolls onto ceilings and walls, initially looking like an orange peel's surface. Running over it with a Plexiglas knife then diminishes the roughness, creating a "knockdown" effect. Use a plastic loop roller to apply the knockdown mixture to the drywall. Pour the drywall joint compound into a 5-gallon bucket and mix it with water to the consistency of thick cream. Add more compound or water to reach the desired thickness. Pour the mixture into a paint tray. 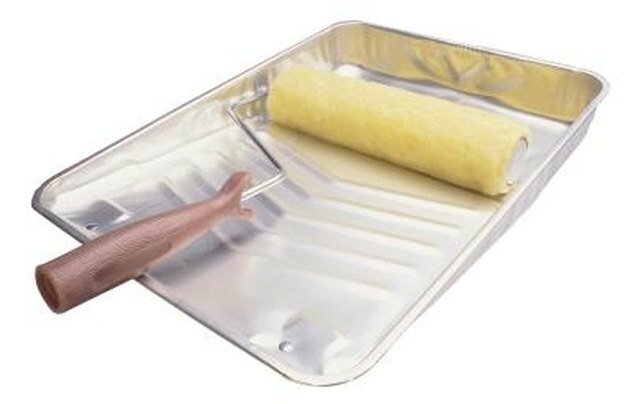 Push a plastic loop roller onto a roller handle, and dip it into the tray, applying the mixture to all sides of the roller. Roll the mixture onto all drywall surfaces. Wait 15 minutes for the mixture to partially dry. Run the blade of a Plexiglas knife over the drywall surface, applying light pressure. Start at the top of the wall and run the knife along the surface down to the center of the wall. Then run the knife from the bottom of the wall and move the knife upward to the center. Repeat this process until all walls and the ceiling are run over completely by the knife.